The rent at The Villas Apartments ranges from $750 for a two bedroom to a $1,035 three bedroom. Apartments in this building are about 34% more expensive than the Flint average. This is a pet-friendly apartment. The Villas Apartments has a Walk Score of 15 out of 100. This location is a Car-Dependent neighborhood so almost all errands require a car. The Villas... A Community With You In Mind. Discover a peaceful countryside ambiance with well-landscaped grounds right between Flushing and Swartz Creek and an inviting pool and playground Discover bright spacious townhomes and comfortable apartments, with a variety of floor plan options and modern amenities Discover an active community with world-class universities, cultural institutions and historic attractions and eclectic shopping and dining Discover the liberty of maintenance-free living with friendly neighbors and responsive management professionals Discover the affordable luxury of a comfortable, carefree lifestyle at a great value Discover all that can be yours at The Villas. 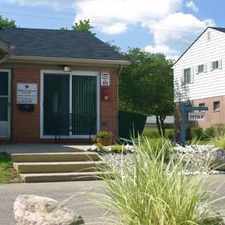 The Villas Apartments is in the city of Flint, MI. Flint has an average Walk Score of 43 and has 102,434 residents.